A short introduction on this one. A highly popular Thai dish that hits all the taste buds in being sour, sweet and savoury with a slight kick of background chilli. With a thirty minute prep and cook time it's not only quicker than ordering a takeaway but in my opinion more flavourful. The main flavour is derived from the homemade curry paste which is key to getting a fresh and vibrant curry. I suspect to save time most takeaways and even some restaurants use pre-made pastes which may be good enough but why compromise for an extra 10 minutes. As an alternative to chicken you could also use beef, prawns or a meaty fish. If you are looking for another Thai dish to go with it try my Pad Thai recipe found here. The first stage, and the most important is to make the curry paste which will act as the fragrant flavour base of the dish. I did this in two stages. First add the garlic and ginger along with two teaspoons of sea salt to a pestle and mortar and grind to a smooth paste. The salt along with the grinding will ensure maximum flavour is released. The second stage is to add the garlic and ginger paste to a blender along with the coriander stalks, shallots, chillis and vegetable oil. Blend until smooth. If you cant be botherd or don't have a pestle and mortar just add everything straight to the blender. 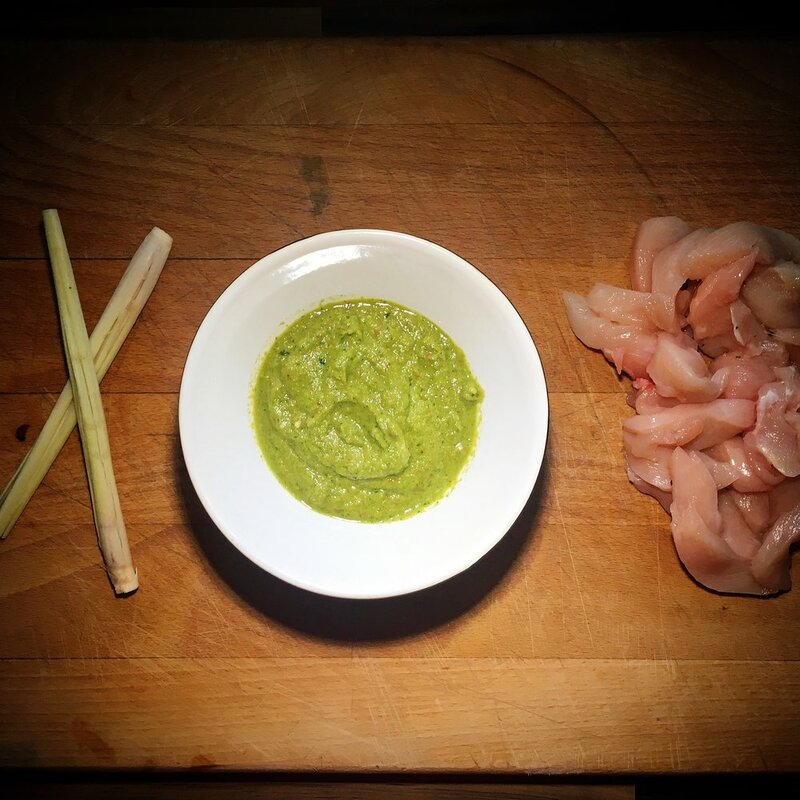 Your paste should be a vibrant green colour (as below) which is derived from the coriander stalks. Next remove the thick outer skin from the lemongrass stalks and give them a bash so they split. This will ensure their fragrant flavour is released into the curry. Some recipes add the lemongrass to the green paste but I prefer just a hint of lemongrass shining through as it tends to over power the other flavours of the dish. Chop the chicken into strips and put the wok on high heat. Once it starts to smoke add 2 tablespoons of vegetable oil and fry the chicken for five minutes. After stir frying on high heat for five minutes the chicken should have took on a golden brown colour which is when you know to add the green curry paste. Continue to fry on high heat so the flavours are released and the paste coats the chicken. After two minutes add the coconut milk along with the fish sauce, chicken stock cube, palm sugar, soy sauce and the juice of half a lime. Let the curry simmer for six-seven minutes until all the flavours have combined and the sauce has reduced to a semi thick consistency. I'm not a huge fan of thin, watery sauces which are common in many Thai restaurants but if this is your thing then simply reduce the simmer time or add a drop of water. Serve with jasmine or basmati rice and garnish with chopped cashews, fresh chilli, a wedge of lime and fresh coriander leaves.